Sign up at Thrills Casino on our site to be able use the promos and coupon codes listed below. Cashout Time: E-Wallets up to 24 hours, Credit/Debit Cards up to 5 business days, Bank Transfers up to 5 business days. Thrills Casino is true to its name. The Betit Operations Ltd. Casinos-owned online and mobile iGaming destination has been thrilling players since 2013. It is licensed by the Malta Gaming Authority, Curacao eGaming and the UK Gambling Commission. Powered by exceptional software providers like Microgaming, NetEnt and NYX and with live dealer games from Evolution Gaming, Thrills Casino brings you the best entertainment. It doesn’t matter if you want a virtual or live experience, you can enjoy gaming your way at this secure and fair brand. Plus, rewards are plentiful at Thrills. New players can take advantage of not one but four welcome bonuses and also get wager-free Super Spins! Think you’ll get your thrills at this casino? Continue reading the rest of this Thrills Casino review to find out! Thrills Casino has games galore and slots are definitely the dominant force. Microgaming, NetEnt, Betsoft, NYX Interactive and Play’n Go will entertain you with their incredible games. Find your winning luck with fantastic slots like Troll Hunters, 7 Sins, Big Bad Wolf, Holiday Season, Super Heroes, Tarzan, Vikings Wild and Immortal Romance. Beyond video and classic slots, the Thrills Casino online offering includes jackpot games, video poker, and a small amount of classic casino game favorites like Baccarat, Pontoon, French Roulette, Triple Pocket Hold’em Poker, American Roulette, Atlantic City Blacjack and more. A live casino powered by Evolution Gaming is also available. You’ll find a sweet number of over 30 live dealer table games covering multiple variants of blackjack, baccarat, roulette and poker. This fully instant play casino also supports mobile gaming. Enjoy slots and several other games on your iPad, iPhone, or Android tablet or smartphone with the premium Thrills Casino mobile platform. 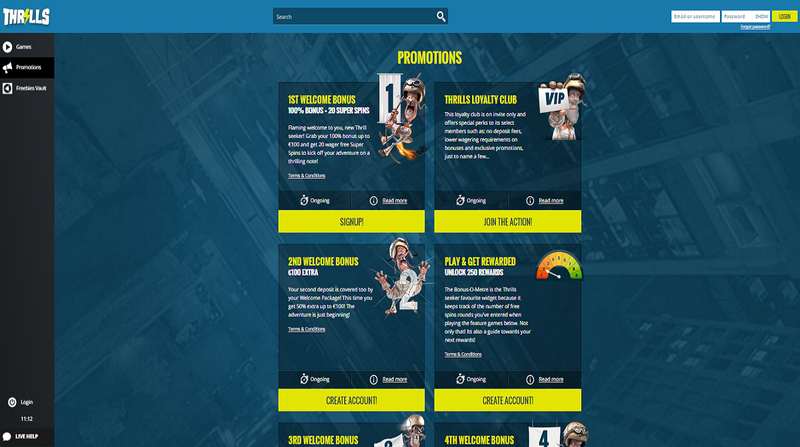 Take advantage of multiple welcome bonuses when you signup at Thrills Casino. Start with a first time deposit bonus, which gives you a 100% match bonus up to €100 + 20 Super Spins! What makes these spins truly super is that they are entirely wager-free. This means that any of your winnings from these free spins are yours to keep right away. Keep playing or withdraw them. The choice is yours! After your first welcome bonus, make your second and third deposit and claim 50% up to €100 on each deposit. 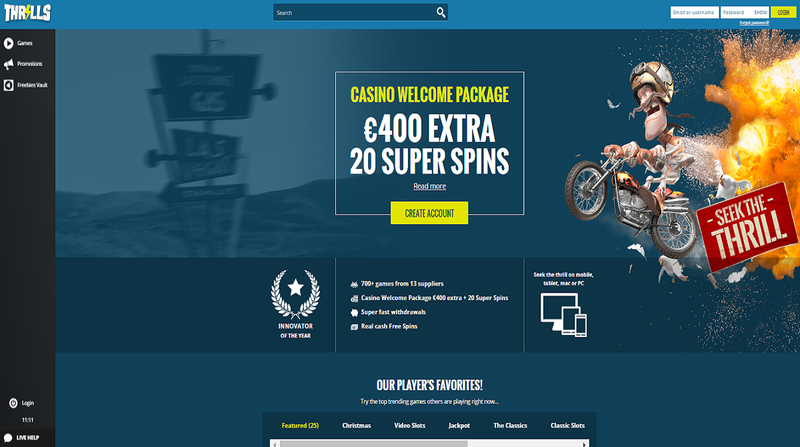 Finally, on your fourth deposit get a 100% bonus up to €100! There is also a Bonus-O-Metre promotion at Thrills where you can play to unlock 250 rewards. Plus, if you like loyalty programs, this casino has a Thrills Loyalty Club and can provide you with exclusive perks. However, to benefit from this program, you will need to be invited to join. All promotions (including the Welcome offers) are subject to terms and conditions. You will be able to choose from several deposit methods include some of the industry’s most popular and trusted banking solutions like Visa, MasterCard, Neteller, Skrill, Pasafecard, Ukash and Instant Bank Transfer. Based on this above list, Thrills Casino payment methods cover credit cards, debit cards, eWallets, bank transfers and prepaid cards. Withdrawals can also be made using most of these methods. Processing times are decent, with eWallet withdrawals processing within one day and credit/debit and bank transfers occurring in up to 5 working days, which is about average. Contact the Thrills support team, available every day between the hours of 10:00 and 00:00 CET. Although it is a bit of a drawback that support is not 24/7, during the hours of operation you can get in touch with the friendly and professional staff via email, live chat and telephone. That being said, there does not appear to be an available FAQ, which is odd, particularly for a casino that doesn’t offer 24/7 support. Thrills Casino has supported play on mobile platform, you just hold your smartphone at the image area to get the direct link to Thrills Casino on your mobile. Thrills Casino has restricted from United States, but you can choose another casinos to play from your country.